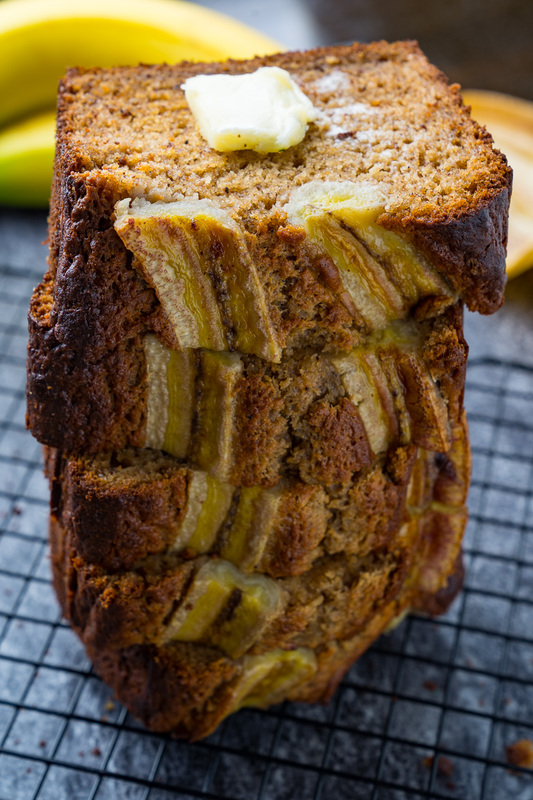 The best banana bread recipe! This banana bread, made with mashed bananas, is so easy to make and so nice and moist and tender! Banana bread is one of my favourite treats, especially a nice homemade one, still warm from the oven, smothered in melting butter and a drizzle of honey! Yum! 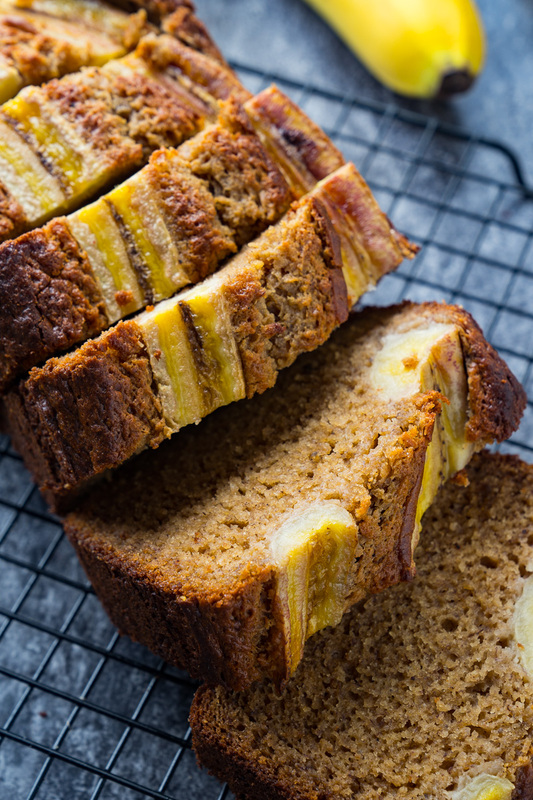 Banana bread is a quick bread made with mashed (over) ripe bananas which help keep the bread moist in addition to adding the amazing aroma and flavour of bananas to the bread! A quick bread is a bread that is made with baking soda and/or baking powder instead of yeast so it’s super easy to make with no kneading or waiting for anything to rise! You simply mix the wet ingredients into the mixture of the dry ingredients, pour the batter into a loaf pan and bake! I am a fan of the basic banana bread but it’s also nice to add chopped nuts, and/or chocolate chips or raisins, etc. 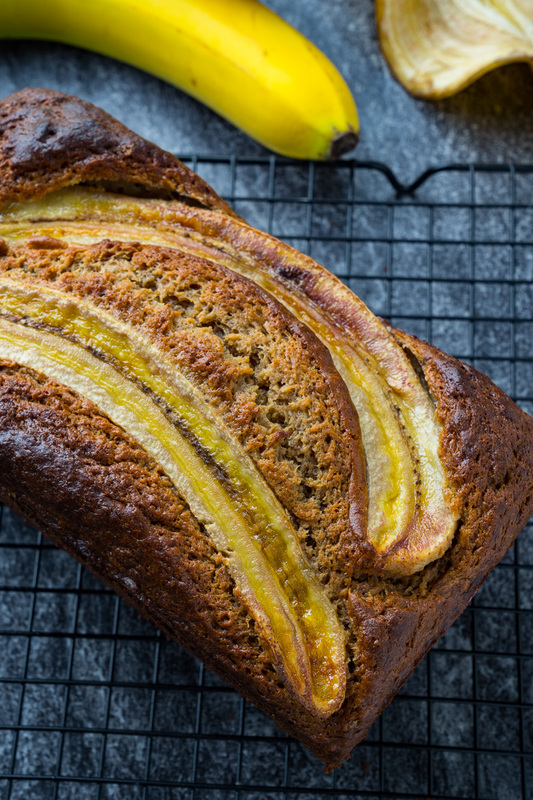 The next time that you are looking for something special for breakfast or a treat, instead of running out to your favourite bakery or cafe, make this banana bread at home! Mix the bananas, butter, brown sugar, sour cream, eggs and vanilla extract before mixing in the mixture of the flour, baking soda, baking powder, salt and cinnamon. Pour the batter into a greased 9×5 inch loaf pan and bake in a preheated 350F/180C oven until golden brown on top and a toothpick pushed into the center comes out clean, about 60 minutes. Let cool a bit before slicing and enjoying! Option: Replace the butter with oil. Option: Add 1 cup chopped nuts. Option: Top with sliced bananas! 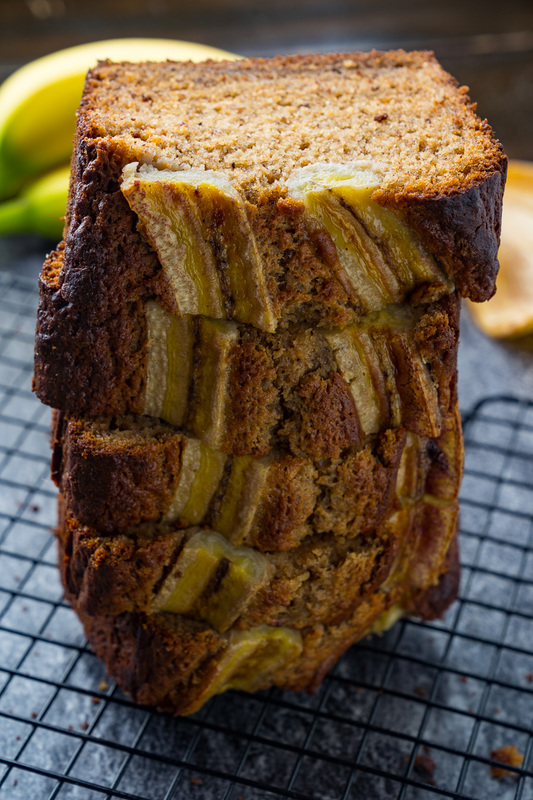 Option: Use a cake pan and make a banana cake instead! 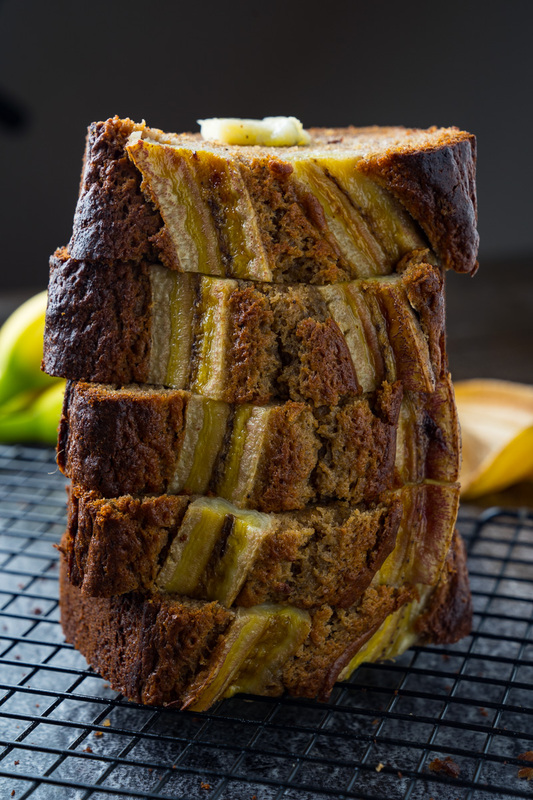 I share your love of banana bread, it’s easy and it’s good for breakfast, a snack or to offer if someone drops by. Nothing quite like the aroma of baking wafting through the house 🙂 Walnuts make a good addition to banana bread, and/or sultanas/raisins/dried fruit. You can also soak some raisins in rum overnight and add that for a bit of kick! Looks great Kevin! All your variations sound great too! I have plenty of “dead” bananas in my freezer with banana bread written all over it!! That would go so well with my tea now, Kevin! It looks wonderful! mmm, i love banana bread. this looks great! i love it with walnuts or pecans and raisins, too. Hi Kevin, that does look extremely good! Slap some butter on it once it’s cool, that is what I would do! Don’t tell anyone! If you are thinking of adding choclate, have a look at Jen’s Banana bread, I have been drooling over it! I never knew you could freeze bananas! 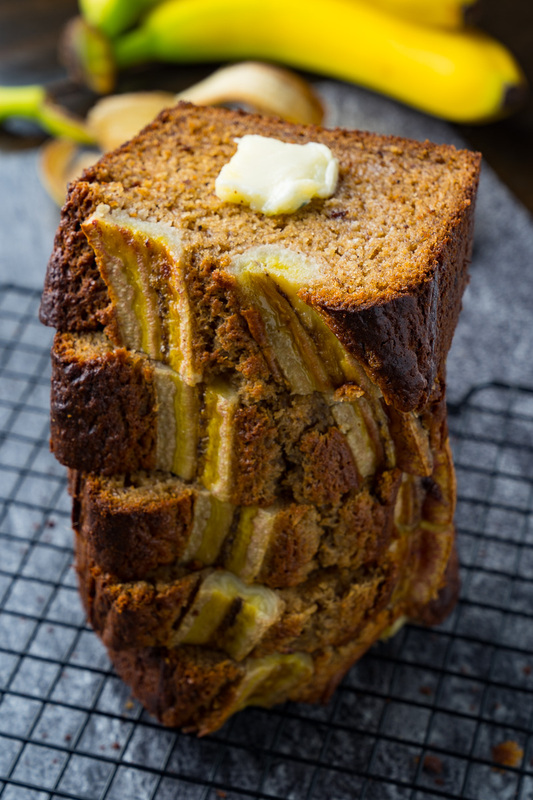 My favorite banana bread has lots of spices – cinnamon, cloves, nutmeg. I haven’t had banana bread since I was in college. You just brought back some good memories! This looks great. I did my banana cake with dark chocolates and it turned out awesome. It tastes great also with applesauce and nuts (I did those versions too). I am a banana bread lover. I was actually craving banana this weekend, and made some banana cookies, so we must have been on the same wave length! I’ve been trying to make banana bread for a while now but I keep eating the bananas before they’re ripe enough! I had to put them in the micro-wave for a couple of minutes to be able to mash them. Now I've hidden 4 bananas for my next attempt so my father won't eat them!! Thank you for the recipe. I just baked it a few minutes ago. I only had 1 cup of bananas, but it still came out delicious! Instead of butter can I use applesauce and can I use I cup of whole wheat flour in place of the AP flour. Anonymous: Both of those changes would work! Hi Kevin, Your recipes are superb and the photography is awesome. Well done in all ways, I love to get your blogs, you are so talented. I am sitting here wishing I could have that loaf for dinner! I have been advised to gain weight!